While 2014 is not yet over, we are happy to report that Tallahassee home sales will finish stronger in 2014 than they did in 2013. Sure, the market is still far behind the numbers that we have come to expect in Leon County over the past 20+ years, but the positive growth has to be greeted with excitement and optimism for 2015 and beyond. So take a look at the yet-to-be completed graph of residential sales in Tallahassee, Florida and end the year with a smile. 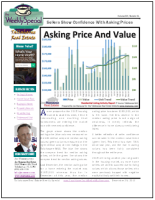 Note: The final Weekly Special edition of the Tallahassee Real Estate Newsletter has been published. Why not take a look at a trend that has home sellers optimistic for higher values in 2015. You can see the report by clicking this link, or you can go ahead and subscribe to the Tallahassee Real Estate Newsletter in order to receive these reports each Monday morning. 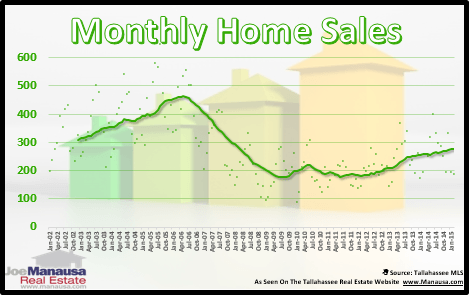 The real estate graph below shows the number of closed Tallahassee home sales each month (shown as a diamond), while the green line shows the average number of homes closed each month over the past year (the one-year trend). Currently, with three "closing days" remaining in 2014, there have been 240 closed residential sales in Leon County, Florida for the month of December. Residential sales includes single family detached homes, condominiums, and townhouses. That is only 21 sales behind December of last year and looks to be the best December on record since 2006. This means that the number of closed home sales for all of 2014 will end up being 5% to 6% better than what was recorded in 2013, and 2013 was 22% better than 2012! The most exciting news is that these two sound years of recovery still leave plenty of upside remaining in a market that is only trading at levels last seen in the early 1990s. As we have explained in previous reports, the population in Leon County has grown more than 40% since 1991, so we believe that Tallahassee home sales should be proportionately higher to serve the needs of these extra people.